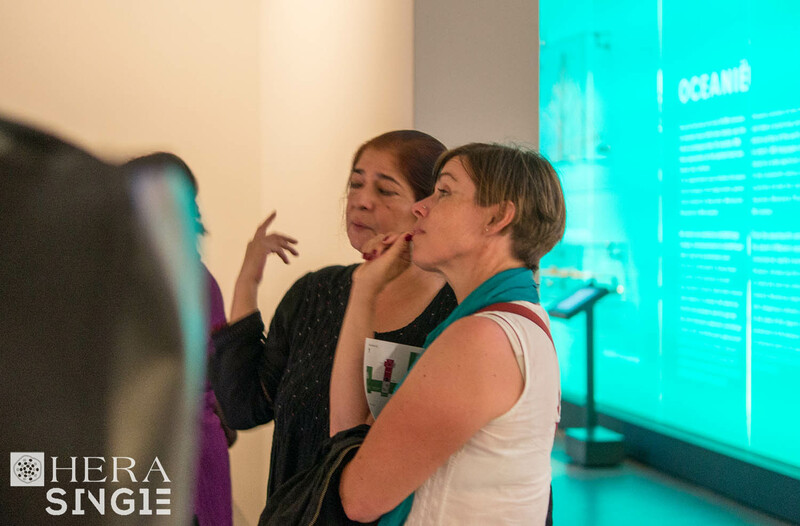 In conjunction with HERA SINGLE’s final conference Sexing the City at the Research Center for Material Culture in Leiden, NL, the Volkenkunde Museum opened an exhibition featuring artworks by three prominent artists from China and India. Please read on for some impressions from the opening night and further information about the artists and their work. Introductive text and work #10 of the series "背景" by Guo Qingling. Photo: Tony Buchwald. 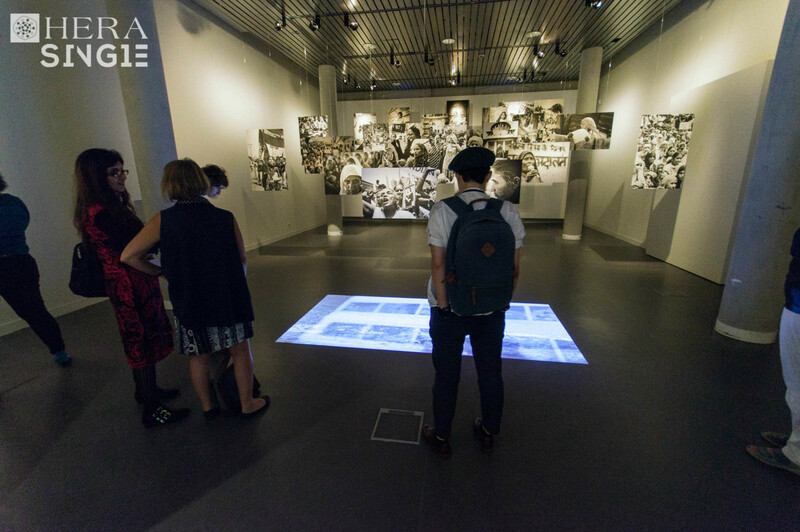 Entrance to the exhibition room for the photograph/video installation "Record/Resist" by Sheba Chhachhi, accompanied by her video interpretation of the fieldwork and research experience of the HERA SINGLE team. Photo: Laila Abu-Er-Rub. 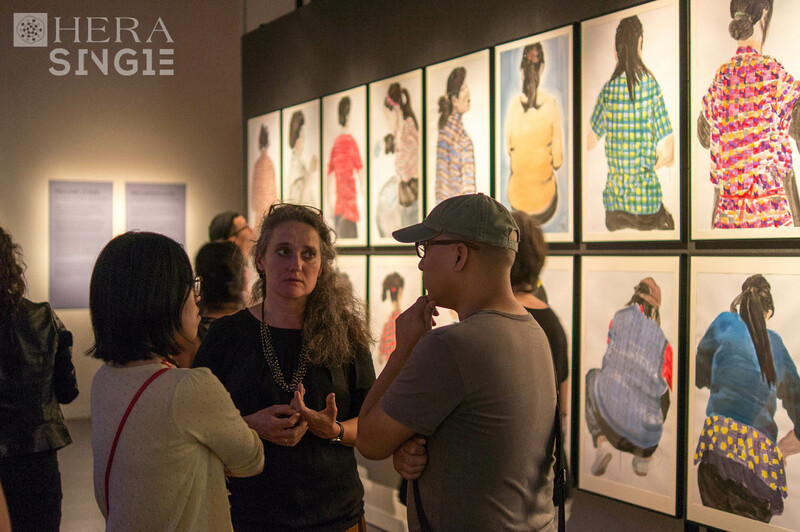 Chenying Pi, Christiane Brosius, and Li Xiaofei in front of the two main rows of Guo Qingling's exhibition of the series "背景". Photo: Tony Buchwald. Detail of "Record/Resist" by Sheba Chhachhi. Photo: Tony Buchwald. Yiu Fai Chow in front of Guo Qingling's "背景". Photo: Tony Buchwald. Raminder Kaur, Barbara Mittler, and Li Maizi in front of Sheba Chhachhi's "Record/Resist". Photo: Tony Buchwald. Sheba Chhachhi and Melissa Butcher. Photo: Tony Buchwald. Life in the city offers numerous opportunities for growth and self-expression. However, it also brings with it different forms of tension, anxieties and feelings of insecurity. Men and women experience both these opportunities and the insecurities in distinct ways. In this exhibition, three artists explore precarious urban experiences, focusing on women in two rapidly growing Asian cities. The city is a place of desire, where like-minded people can find each other and where the relative anonymity provides opportunities to escape given norms or expectations. With urbanization, however, also comes insecurity. Opportunities offered by the city do not have the same effect on everyone. New opportunities and risks have a gender-specific nature. What role does gender play in the way the city is perceived and experienced? Across Asia cities are changing rapidly under the influence of rural to urban migration, economic growth and globalization. These rapid changes are accompanied by new forms of exclusion, insecurity and precarity, particularly along lines of gender and class. How has this changed over time? Who has the right to the city? What space do women, past and present, hold or claim in these changing societies? How are they perceived by the outside world and how do they present themselves? In this exhibition, three artists, Sheba Chhachhi from Delhi and Li Xiaofei and Guo Qingling from Shanghai, respond to these questions, exploring the precarious position of women in the rapidly changing urban landscapes. 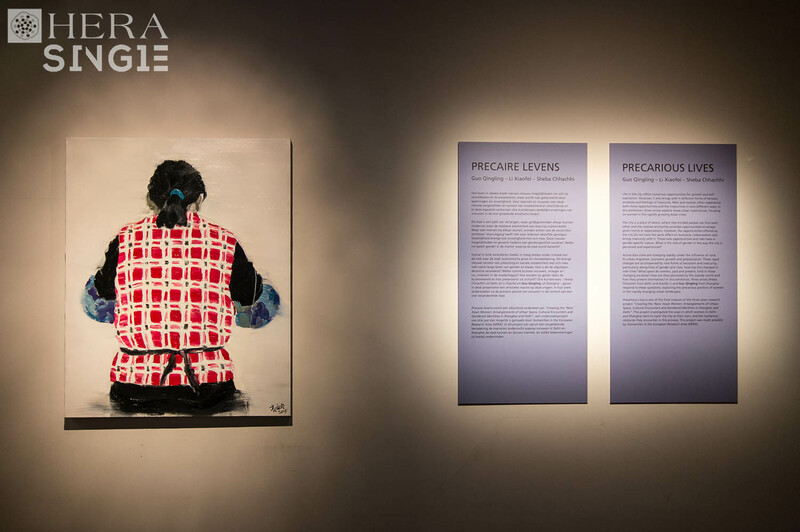 Precarious lives is one of the final outputs of the three research project “Creating the ‘New’ Asian Women: Entanglements of Urban Space, Cultural Encounters and Gendered Identities in Shanghai and Delhi”. The project investigated the ways in which women in Delhi and Shanghai dare to claim the city as their own, and the numerous obstacles they encounter in this process. This project was made possible by Humanities in the European Research Area (HERA). “背景 010”, Artwort by Guo Qingling, 2015. 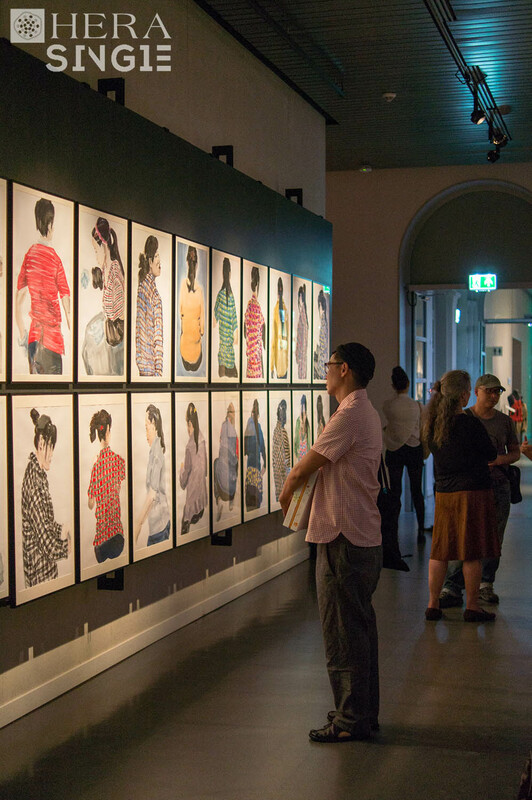 Guo Qingling portrays the backs of female migrant workers. Masking their faces, the work is a metaphor for the way these women are rendered invisible, both by the government and their employers alike. Despite the anonymity of the women portrayed, Qingling shows the different personalities that lie behind the curved shoulders or the straight backs. In soft but powerful brush strokes she portrays both the fragility and the fortitude of these women. Video still, “Assembly Line” No. 30, 2013. 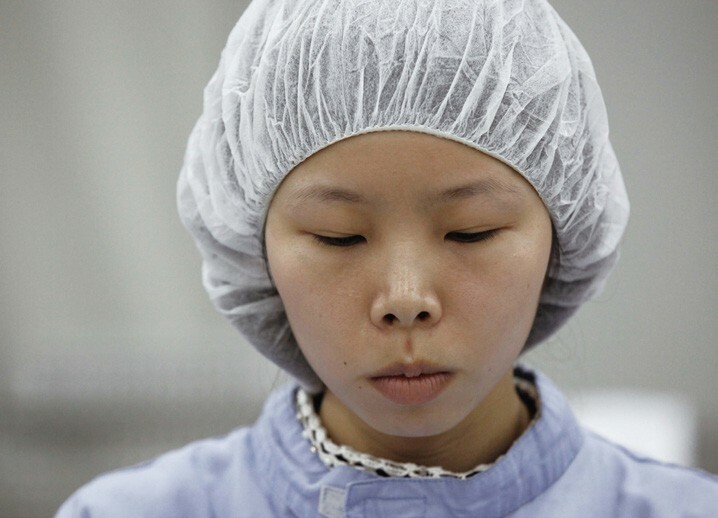 Since 2010, Li Xiaofei has been developing the work Assembly Line. Part of the work explores the place occupied by women in an environment of extreme efficiency, such as the factory. Where does the individual end and the system take over? In his work the aesthetics of the machine overlaps with the lives of workers, often migrants. They now have a face, a voice; in China but also elsewhere in the world. “Record/Resist” by Sheba Chhachhi, 2012. 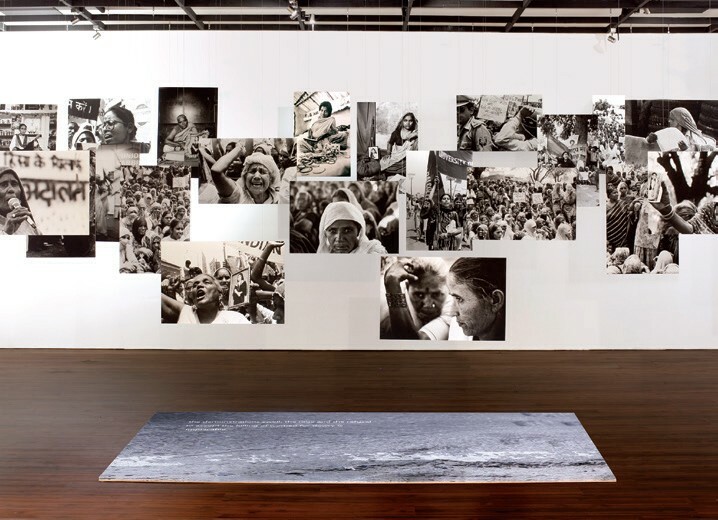 In Record/Resist Sheba Chhachhi interweaves personal memories with historical events. 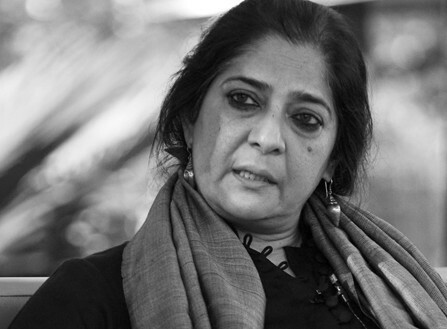 From the eighties she has been closely involved in the feminist movement in India. The paying of dowry, officially abolished but not yet obsolete, has led to numerous conflicts and acts of violence against women. For this reason this has been high on the agenda of the activists. 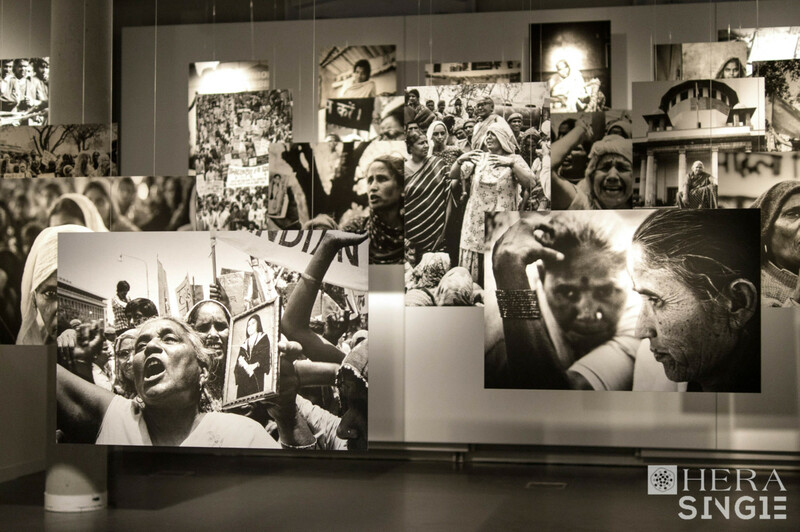 Her own memories, and the dual role that she has played as an activist and photographer, are integral to this installation that explores the struggles of women in India. The installation is accompanied by a short film which works with situations produced by performative interventions in the city, provoked by narratives from the research experiences of the HERA team. 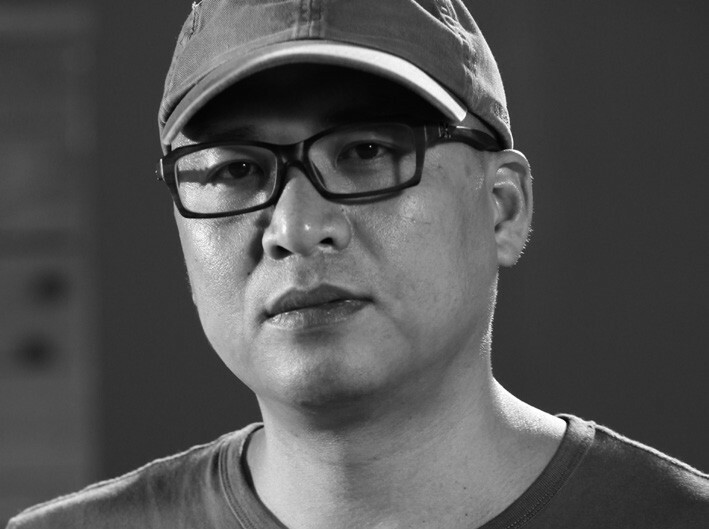 Guo Qingling (Hunan, 1973) works in various media, including painting, video and audio. Her socially engaged work focuses primarily on women’s lives. 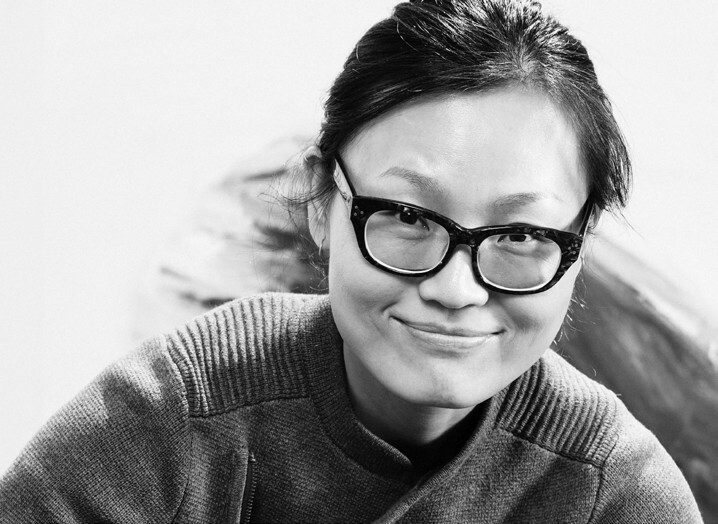 Guo studied theatre design at the Theatre School in Shanghai, where she currently lives and works. She has exhibited in numerous exhibitions including museums in both Asia and Europe. 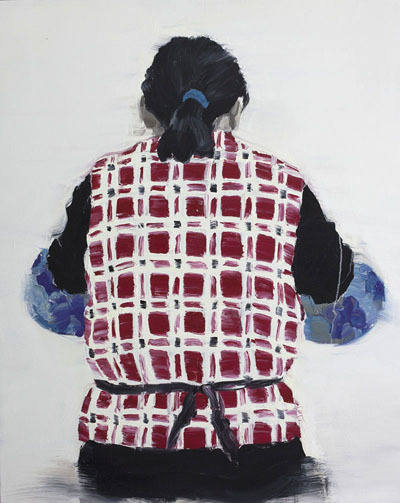 Li Xiaofei’s (Hunan, 1973) work explores social change in contemporary society. In recent years he has concentrated particularly on the processes that underlie repetitive assembly line labour, and on what it means to work in highly efficient and institutionalized environments like factories. He works in different artistic forms and media. Li has exhibited internationally and received several awards. In her work Sheba Chhachhi (Harar, 1958) explores the themes of women’s rights and climate change. As an activist and photographer, she has documented the feminist movement in India since the eighties. 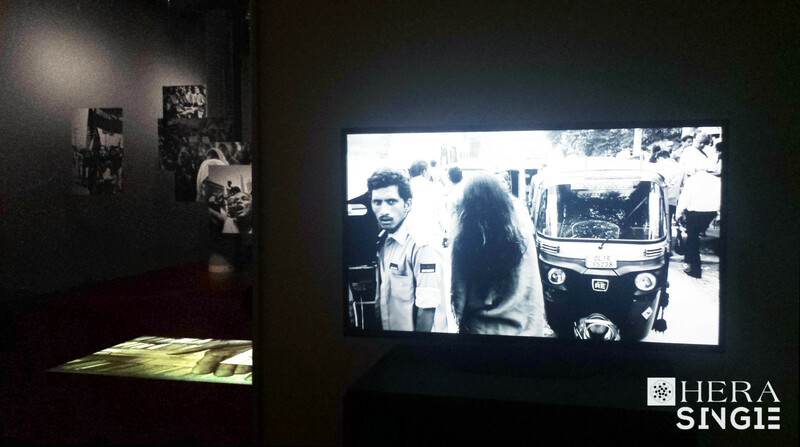 Today, Chhachhi creates mostly multimedia installations where text and photography are combined with moving images. Her work can be found in numerous important private and public collections, including the Tate Modern in the UK.